Alex and I had an absolutely wonderful day on Wednesday. Aside from the early morning shock of finding out that he has the ability to climb out of his playpen, the day couldn’t have gone better. We went back to the Pittsburgh Toy Lending Library after lunch, where Alex was able to run around, climb on everything, and, as he is prone to do, choose a favorite toy that is not really a toy. His favorite toy that day? 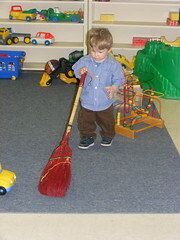 A child-sized broom. He loved that thing. We probably walked around the whole place a dozen times while he pushed the broom into every corner and made sure that every. single. person saw him with it. When the time came to leave, I decided that with the amazing mood that Alex was in I would use that time to continue my search for the perfect brown boot. We went to the mall (the mall that Burgh Baby suggested because of its young-toddler appropriate play area), which is becoming an increasingly regular occurrence for us during this bitter weather. 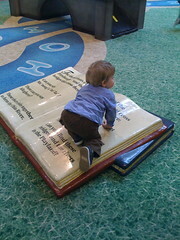 I didn’t find boots, but Alex enjoyed the play area tremendously. He climbed, slid, ran, jumped, and banged like a mad man. As we were getting ready to leave, we took a quick break to eat a snack in one of the lounge areas in the middle of the mall. There were mostly elderly men sitting there, but there was one woman who I felt staring at us as we sat down and I started giving Alex his crackers. This woman was wearing all beige, including a beige purse, and walked over to us with her walker. She looked at Alex and then at me. I thanked her, and we chatted about how old he was, what I was doing with my time and how I liked being a mother. She was watching Alex the entire time. She eventually told me that Alex looked almost exactly like her grandson did as a baby. She said her grandson had the same hair and big blue eyes. Alex’s chubby cheeks were very similar, and she couldn’t believe how much it felt like she was looking right at her baby grandson. Apparently, her grandson recently died. He was 26. He left behind a newborn daughter, wife, and four generations of family that can’t believe he is gone. At the end of her explanation, she looked at Alex and told him that he was going to have a great life. She said anyone with cheeks like his is going to do great things. She thanked me for allowing her to sit with us for a while, and said that it was the best she has felt since she lost her grandson. It is days like that when I am reminded how wonderful life is. How amazing Alex is. How lucky I am. And she is right. With cheeks like his great things will surely come. oh man, what a sad and beautiful story! I’m all choked up over here! Totally teared up right here in my cubicle at work. What a fantastic afternoon and what a fantastic encounter. Still, a shame you didn’t find the perfect brown boot. When you do find ’em, let me know… I’m on the same quest. I’m crying!!! What a beautiful moment in time. It truly makes you appreciate the little ones in your life. 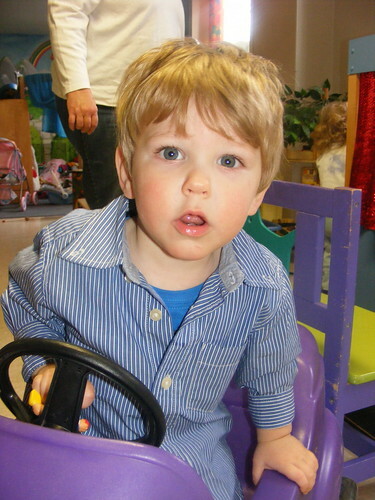 He’s going to be a heartbreaker, that’s for sure! she was an angel that helped you find words. miracles come in all shapes, sizes and places. Pinchable cheeks are most definitely a sign of greatness.